The Oxford Historical Society is located in the ground floor of the ‘Governor’s House’, just north of the Oxford County Court House building. The house is south of Buller St., between Light St. and Graham St. Entrance is from the north side of the Governor’s House. Our Resource Centre offices are in the same foreground buildings (shown right) as the Oxford County Archives. The house was originally the Governor’s House of the Old Oxford County Jail; was extensively renovated between 2009 and 2012 and a new annex added on its left. The Resource Centre offices are open Monday to Friday between 10 am and 4 pm. They are staffed by volunteer members of Oxford Historical Society and the OGS Oxford Branch, to help you with your historical research. For help researching non-family local history, please phone the Resource Centre at 519-421-1700, prior to your visit to ensure that an Oxford Historical Society member is also present to assist you with your research, thank you. The Resource Centre is closed all statutory holidays. 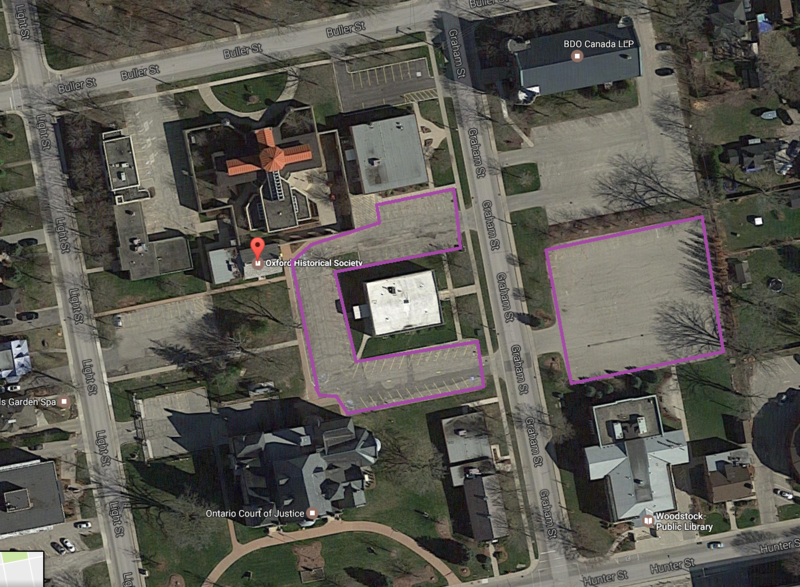 The public parking lots are highlighted in purple in the picture below, please do not park in reserved spots. Click on the image for a larger view. 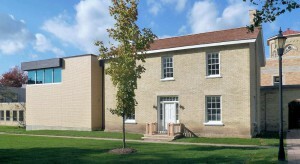 This building is also home to the Oxford County Archives and the Oxford Branch of the Ontario Genealogical Society.